Gift Cards Available from The California Wine Club. Your source for fine wine online! Spend less time searching for that rare vintage or gift - we've done the work for you! Amid all the controversy over powerful wines with scary levels of alcohol, a confusing truth remains: Some wines can carry high alcohol with style and grace. These two reds approach 15 percent, but they'd go great with a Christmas rib roast.  The California Wine Club Gift Cards Available from The California Wine Club. Our Internet Radio TalkShoe wraps up the year in wine today, our WineLovers forum is sharing tips on sparkling wines for the holidays, and our online poll invites your wine-related New Year's resolutions. Looking back over the past 12 months as the year 2007 nears its end, it seems that one of the most visible issues in the world of wine this year has been a rising mutter of wine-geek crankiness over increasing levels of alcohol in wine. I touched on this most recently in an August article, Recent Rants, inspired by a California wine merchant's decision to remove from his shelves any table wines claiming 14.5% alcohol or more. For any wine enthusiast who remembers the days when most table wines hovered around 11 to 12.5 percent alcohol - and it hasn't been all that long since more powerful wines started to dominate the market - it's easy to sign on to a crusade against over-ripe grapes and the potent wines they make. Quite a few of the more powerful modern wines seem to be made with an eye to pleasing the big-name critics with blockbuster "fruit bombs" that seem to have lost any connection with subtlety, elegance or the soil from which they grew, making these new wines veritable icons for a wine trend that more than a few of us decry. Many observers also see a link between increasing alcohol and global climate change, another issue that adds a distinct political note to the discussion. But the problem here is that, as with all generalizations, one size doesn't fit all. Grape growing and wine making are complex pursuits, subject to many variables that range from the soil to the weather to the wine-maker's hand. As the British wine writer Jamie Goode recently pointed out with his usual scientific rigor on his Wine Anorak Website ("Rising alcohol levels in wine: Are they a problem, and what can be done about them? "), over-ripeness is a more complicated matter than it seems. Simply declaring that grapes should be picked earlier as the climate grows hotter overlooks the reality that there is more than one kind of ripeness in wine grapes. "Sugar ripeness," the traditional measure, is simply concerned with fruit reaching a level of sweetness that will produce the desired level of alcohol. But "physiological ripeness" or "flavor ripeness" is a more complicated process that may not occur at the same rate as sugar ripeness. If searing heat raises sugar levels beyond normal before physiological ripeness is achieved, the wine maker faces a dilemma: Pick early to hold alcohol in line, or delay picking to achieve better flavor at the risk of blockbuster-level alcohol? Neither option, frankly, is ideal. Adding to the confusion is an emerging reality: As more wine makers learn to deal with high sugar levels and ripeness in the vineyard, we're starting to see some wines that carry their high alcohol with style and grace. When alcohol levels don't dominate the wine with a hot flavor or harsh "afterburn," and the overall flavor profile of the wine appeals, I'm more likely to overlook the frightening numbers on the label ... but it's still sensible to be aware of what you're drinking when you make that decision whether to have a second glass. Today's featured wines - one from the Old World, one from the New - both come in at alcohol levels that would bar them from Mr. Corti's store. Nevertheless, both show excellent balance and complexity, and the alcohol doesn't make itself obnoxious. Demonstrating that blockbuster alcohol doesn't necessarily render a wine impossible to match with food, either would make a splendid match with a Christmas rib roast. FOOD MATCH: While it would be an outstanding choice with prime rib or rare steaks, it went well, too, with natural, locally raised pork chops sauteed with garlic and a rich cream sauce to bring them up to meet this hearty red. Clear but very dark garnet. 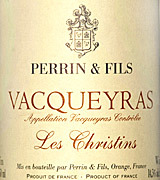 Attractive and complex dark fruit aromas, cherries and berries, subtle smoke and "meat," a definite touch of the Northern Rhone. 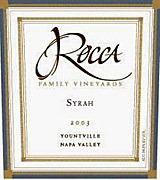 Flavors consistent, ripe Syrah fruit and firm acidity in balance. Again, 14.8% alcohol fits in and does not intrude. FOOD MATCH: Beef is its natural partner; it blossomed even in a rather offbeat pairing with Italian-style meatballs in "gravy." Happy Holidays from The California Wine Club! For a last-minute gift that doesn't look it ... The California Wine Club can help. Place your holiday gift orders now at www.cawineclub.com and you'll be given the opportunity to print a beautiful full-color gift card that you can sign and give to your gift recipient. Make it extra special and wrap the gift card with the latest issue of Wine Spectator or a set of wine glasses. No time for that either? Slip the gift card into a stocking for a Christmas morning surprise! Since 1990 The California Wine Club has been making the holidays memorable with limited production wines, hand-selected from California's best "mom & pop" wineries. Call us now at 1-800-777-4443 to order. Each gift month includes two bottles of award-winning wine and the club's beautiful and entertaining 12 page publication, Uncorked. Just $34.95 plus shipping. Send as many months as you wish and save on gifts of 3, 6, 9 and 12 months. Visit www.cawineclub.com or call 1-800-777-4443. Saratoga Wine Exchange One Stop Gift Shopping! The Saratoga Wine Exchange is your source for fine wine online! Spend less time searching web sites for that rare vintage or gift - we've done the work for you! Our online store is easy to use, flash-free and full of fine, rare and collectible wines including Kistler, Turley, Screaming Eagle, Harlan Estates, Mouton, Domaine de la Romanée-Conti and many more. Find exactly what your cellar or gift list needs right here, 24-hours-a-day, with just a click of your mouse. Check out our most popular section – wines rated 90 points and above. Wines are listed by price so you can easily search and find wines rated 90 points or above in your price range. Makes for easy holiday shopping!" Last week's show focused on Gewurztraminer. All our programs are available for listening at any time in the archives! Planning to pop the cork on a bottle of Champagne or other fine bubbly for Christmas dinner or to ring in the New Year? You'll find plenty of specific buying tips - and you're welcome to add your own - in this active conversation in our WineLovers Discussion Group. As 2007 nears its end, it's time for our annual discussion about our wine-related resolutions in the New Year. Will you drink more wine, or less? Spend more or economize? Try to learn something new? Or the always useful "other"? Tell us more about your resolutions in our weekly poll!